The snow continues here in Wisconsin, and yes, it’s only the beginning of November. Don’t remind me. For those of you who don’t get a lot of snow and think it’s pretty, I’m happy to send as much as you’d like your way. I’ve officially traded in my flip flops for boots, my shorts for insulated pants and my lemonade for. . .cocoa. I don’t know about you, but in the winter months, I could drink hot chocolate pretty much all day long. 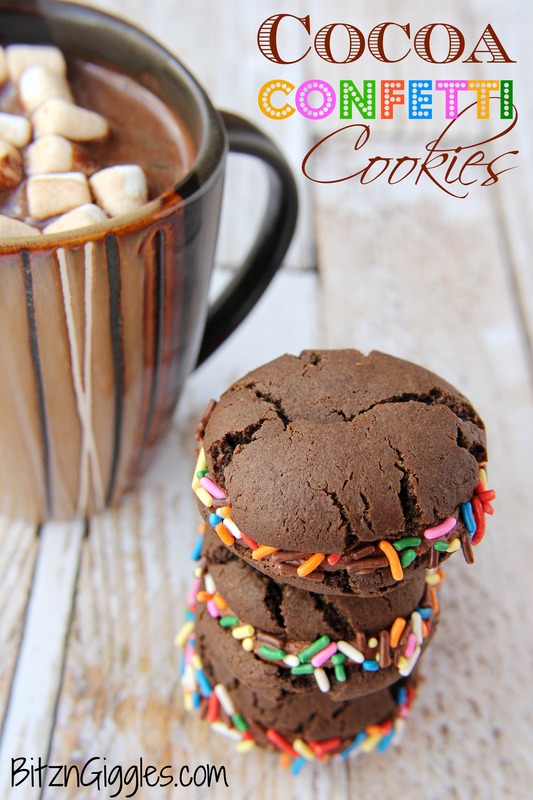 If you’re a hot chocolate fan like I am, you’re going to love these Cocoa Confetti Cookies. 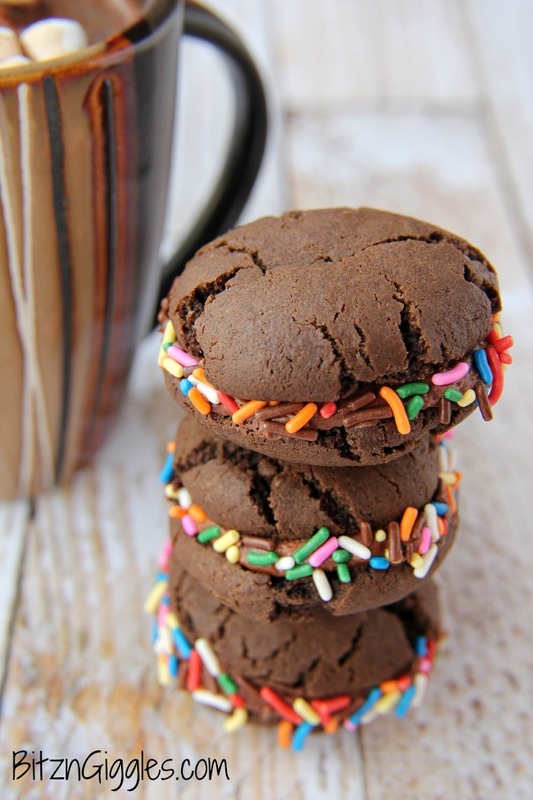 Creamy chocolate frosting sandwiched between two cocoa-flavored cookies and then rolled in sprinkles. They’re so delicious, quick and easy! I’m all about easy when it comes to baking. Who isn’t, right? 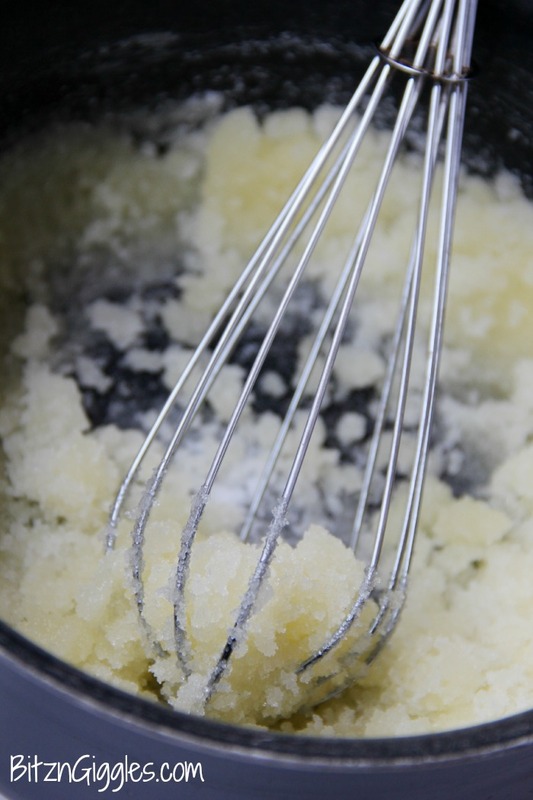 Have you ever found a recipe online or in a book, started getting all of the ingredients together, notice it calls for softened butter and all you have is that rock hard stick of butter waiting in the fridge? That was me. . .all the time. But, not anymore. I love cooking and baking with I Can’t Believe It’s Not Butter!®, and appreciate the fact that it’s spreadable straight out of the refrigerator, so there’s no need to wait for it to soften! Who has the time? Nothing stands in the way of me and my cookies! If you haven’t already heard, they’ve come up with a new recipe that offers fresh butter taste and is unbelievably delicious! 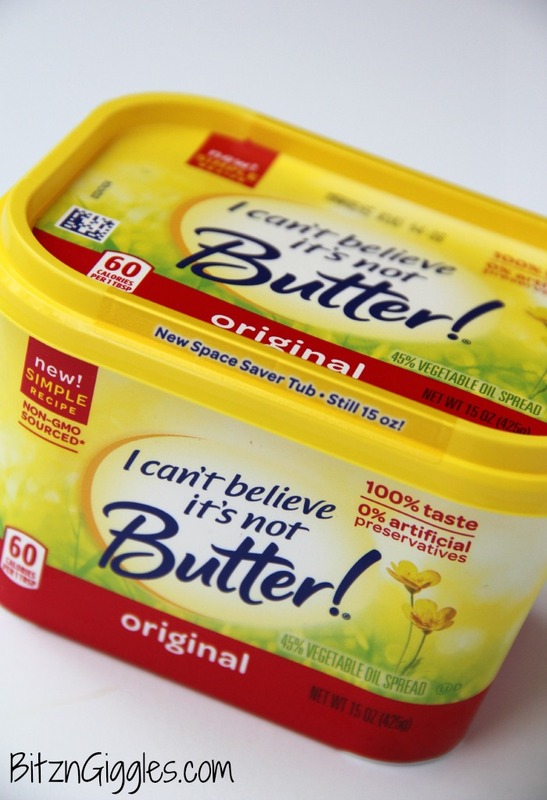 The new I Can’t Believe It’s Not Butter!® is made from REAL, simple ingredients you can recognize, like a delicious blend of plant-based oils, purified water and a pinch of salt – so easy to incorporate into a healthy, balanced diet because you can trust what’s inside! What’s even better, is that you can find it in grocery stores nationwide, just in time for the holiday baking season, available in Original, Light, and Olive Oil varieties. And just so you know, it’s not just for baking, it’s for spreading, topping, sautéing and cooking, too! Today, however, we ARE baking so, let’s get to these cookies! You start by combining the cocoa, flour, baking soda and salt. That’s a whole lotta’ goodness in one bowl! Then you grab another bowl for the next part. I know you heard me rant earlier about softened butter. For this recipe, you don’t need softened butter, but you will need to heat your I Can’t Believe It’s Not Butter!® before you add it to the sugar. I PROMISE it STILL takes less time than that stick of butter you have in the fridge. The cookies at this stage turn out delicious and gorgeous, but we are NOT done. Nope. We’re dressing these cookies up to the nines – spreading chocolate frosting on the flat side of one cookie and sandwiching it between another. And just because they’re so much fun and add a pop of color, we’re adding sprinkles. Of course, we are. Have you met me? Come on now. Feel free to add some to your cup of hot chocolate, too. The sprinkles AND the frosting, I mean. 😉 The cookie dipping is just presumed. For more information on I Can’t Believe It’s Not Butter!®, visit their website and find more great-tasting recipes, here! 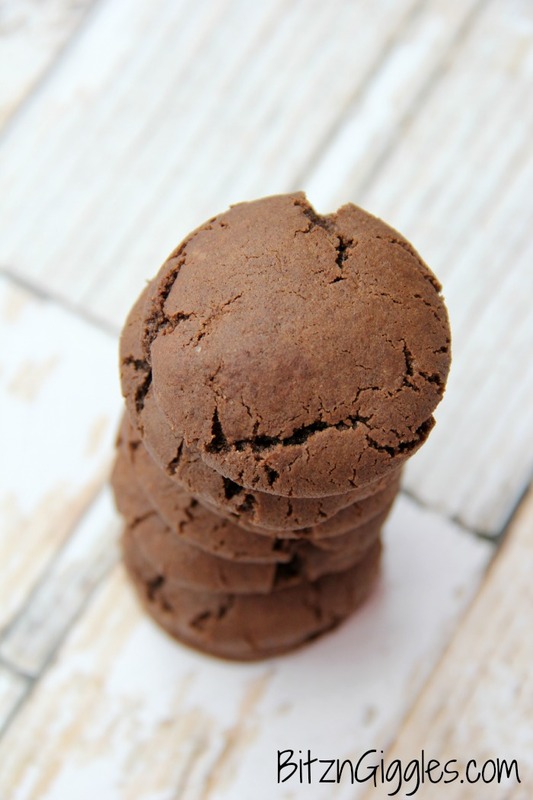 Chocolate frosting is sandwiched between these delicious cocoa-flavored cookies before they’re rolled in sprinkles! 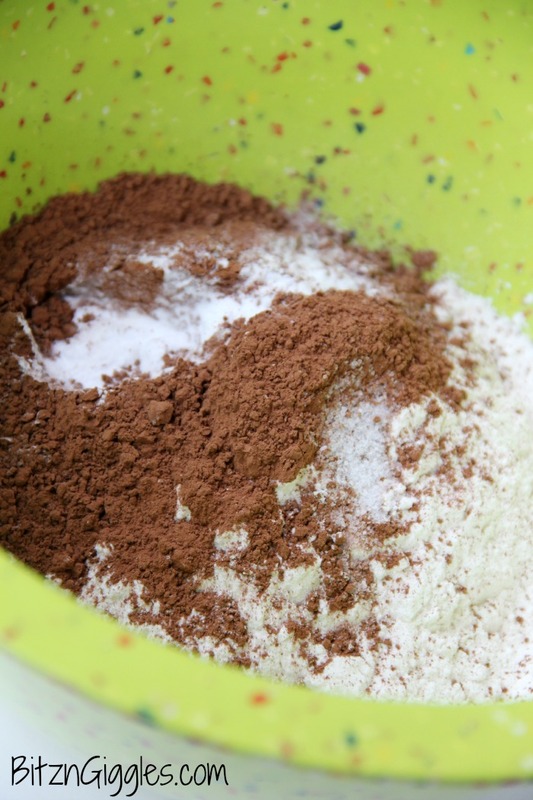 Combine cocoa, flour, baking soda and salt in medium bowl. Melt I Can’t Believe It’s Not Butter in a large saucepan over medium heat; cool slightly. In another bowl, add the I Can’t Believe It’s Not Butter and the sugar, and whisk until smooth. Whisk in the eggs, one at a time until well-blended. Stir in the vanilla and add the flour mixture until well-combined. Wrap the dough in plastic wrap; refrigerate 2 hours. Shape dough into 1 inch balls and place onto greased cookie sheets. Place the remaining 1/2 cup of sugar in a shallow bowl and roll the balls in sugar. Bake 12 minutes and then let the cookies stand for about 5 minutes before transferring them to wire racks to cool completely. Spread frosting on the flat side of one cookie and then top with another cookie to make a sandwich. Place sprinkles on a plate and roll the outside edges of the cookie in the sprinkles. These sound yummy!! My kids would love them. Thank you for linking up to Party Time and we hope to see you again next week! Yummm! I am doing the same campaign and was wondering if I should attempt to bake something because of how different margarine is. Glad this one worked out!! So now I am craving sprinkles and chocolate at 7am!!! These are perfect for any day of the week and especially when its snowing and blistering cold!! Pinned! Is that a bad thing, Meg, to be craving chocolate so early? For me it’s a 24/7 thing so I’m pretty certain there’s no hope. 😉 Thanks for the pin! These look so fun! I could definitely enjoy a few while drinking a cup of hot cocoa! Me too, Beth! And with the weather we’ve been experiencing already in the Midwest I’m going to need LOTS of cocoa and cookies to make it through! I just moved from Wisconsin last summer. Now I’m in Ohio and I dare say we get more snow here because of Lake Erie! Love these cookies and I know my girls would as well! Oh, Melanie – you poor girl. Best of luck getting through the winter season and yes, make some of these cookies! ADORABLE!!! I really can’t believe its not butter! Those look incredible! Thanks so much, Nicole. I was amazed at how easy I Can’t Believe It’s Not Butter was to bake with, too! Cutest cookies ever! Seriously, I am obsessed, and no butter?! Amazing! Pinning! I know, right, Cate? Thanks for pinning! I’ve never used I Can’t Believe It’s Not Butter in baking, so it is great to see the end results! Looks awesome! 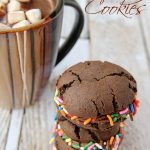 I had to pin these adorable cookies – already! I am going to attempt them with chia ‘eggs’. They look great! So, I’ve never tried chia eggs, Ginny. It sounds pretty healthy to me, though. You sure they’re okay to put on cookies? LOL Just kidding! Let me know how they turn out! I’ll take your snow!! 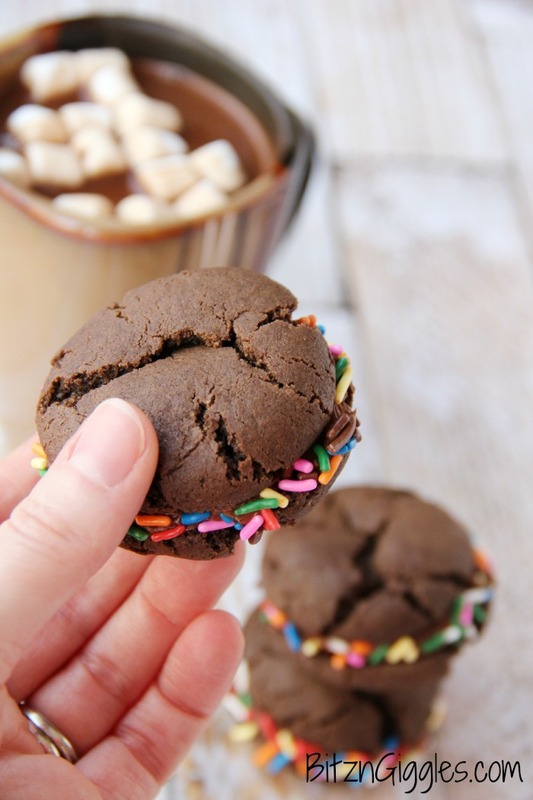 Hot Cocoa Cookies are perfect! I’ve also been playing around with the new I Can’t Believe It’s Not Butter this week — I’m impressed! That’s awesome Mandee, thanks! I’ll definitely be stopping by!